We’d love your help. Let us know what’s wrong with this preview of Nasty, Brutish, and Long by Ira Rosofsky. 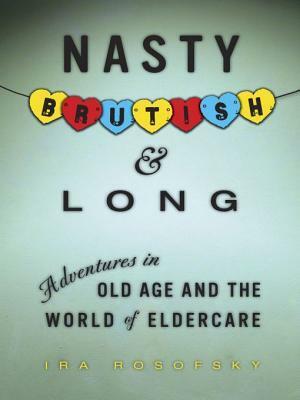 To ask other readers questions about Nasty, Brutish, and Long, please sign up. I loved this book! Rosofsky takes his perspective as a psychologist to those in assisted living centers and nursing homes and adds his insights as a voracious reader, an East Coast dweller, and as a cultural Jewish person and delivers an oustanding book. He balances compassion, intelligence, and irony as he examines the social and emotional landscape of older adults managing (or not managing) in community living centers. Woven within his observations of residents is the story of his own father's I loved this book! Rosofsky takes his perspective as a psychologist to those in assisted living centers and nursing homes and adds his insights as a voracious reader, an East Coast dweller, and as a cultural Jewish person and delivers an oustanding book. He balances compassion, intelligence, and irony as he examines the social and emotional landscape of older adults managing (or not managing) in community living centers. Woven within his observations of residents is the story of his own father's decline, which puts him on the other side of the psychologist's clipboard. Rosofsky, a psychologist who talks to people in a variety of nursing homes, gives us a fascinating look at the world of eldercare. He reflects on his parents' final days and the choices we, as a society, have made about health care for the elderly. As a person in her 80's, I found it very interesting....but a trifle depressing! Ugh. I am quite familiar with the type of facilities he writes of since I am home health therapist. I'd say his assessment of the facilities and the residents is accurate. He doesn't offer solutions and I don't have them either. The reality of aging in America is sort of grim for now (for the majority)- gradually losing independence, freedom to make your own decisions, and a living space that shrinks as the cost of your care increases. If you don't know this already you might want to read it, bu Ugh. I am quite familiar with the type of facilities he writes of since I am home health therapist. I'd say his assessment of the facilities and the residents is accurate. He doesn't offer solutions and I don't have them either. The reality of aging in America is sort of grim for now (for the majority)- gradually losing independence, freedom to make your own decisions, and a living space that shrinks as the cost of your care increases. An entertaining, humorous, admittedly cynical, and sobering look at how the American society handles the final years, written by a psychologist who has first hand knowledge of how the system works. I enjoyed this book. My father passed away 3/21/14 so the topic is fresh in my mind. The book spoke to me. Many scenes were familiar. My perspective is that of a son missing a dad, but this book is valuable read from many other vantage points as well. Check it out.